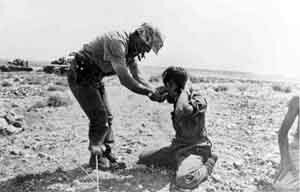 During the 1974 barbaric Turkish invasion against Cyprus, the Turkish army arrested thousands of Greek-Cypriots. 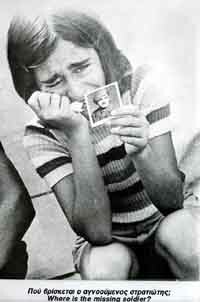 A total of 1619 persons were reported as missing as a result of the 1974 Turkish invasion against Cyprus. They transported many of them to Adana Turkey, or they detained them in Cyprus, either case in the most horrible conditions. Many of them were seen in captivity alive and well, by others who were released later. Turkey, stubbornly still refuses to disclose any information for their fortune, thus violating not only basic Human Rights, but also the International Law. 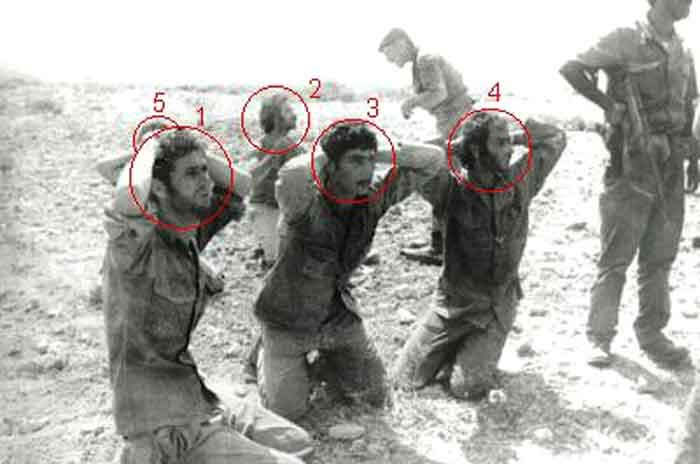 Recently, the leader of the Turkish terrorist organisation TMT, Rauf Denktash, admitted publicly that many Greek Cypriots POWs (Prisoners of War) were slaughtered by Turkish militants. 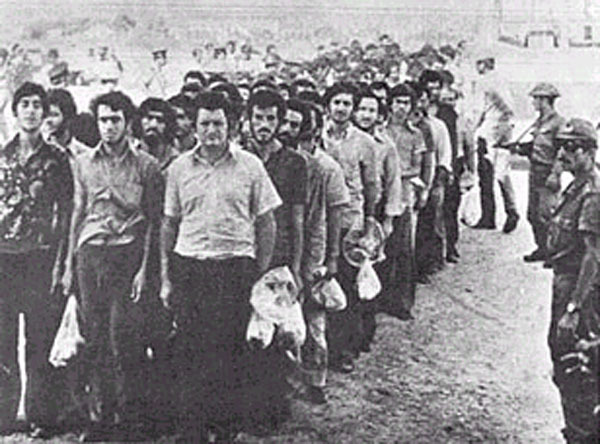 In the photo you can see Greek Cypriots being rounded up by the Turkish army. -Click on the photo to see the enlargement. This photo was taken from the tower of a T-47 turkish tank by a Turkish news reporter. On the right you can see a Turkish armored personnel carrier vehicle M-113 (NATO -American Made), closing up on 5 Greek Cypriot soldiers of the Cyprus National Guard. This photo was published in the Turkish newspaper Gunaydin on the 25th of August 1974. Photo in continuation of the previous one. 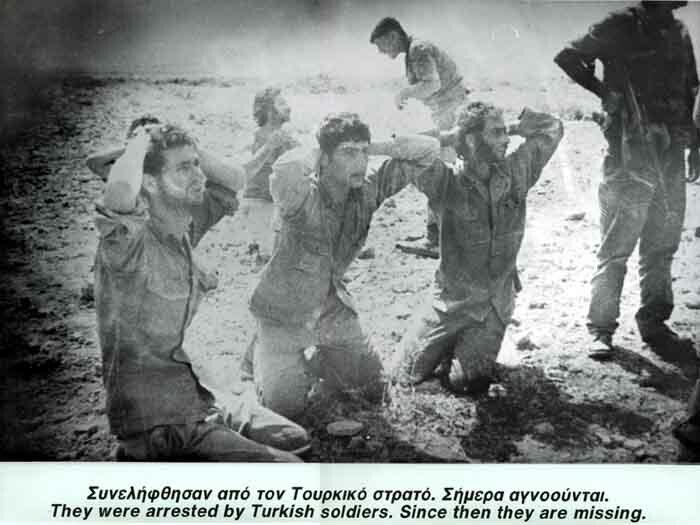 The Greek Cypriot soldiers were captured by Turkish troops. Turkish officer is offering a cigarette to one of the captured Greek Cypriots prisoners of war during the interrogation procedure. Photo in continuation of the previous ones. The Greek Cypriot soldiers were surrounded and captured by the Turkish army after the breakage of the Greek-Cypriot defense lines at "Mia Milia". "Mia Milia" is located north of the capital city of Nicosia. 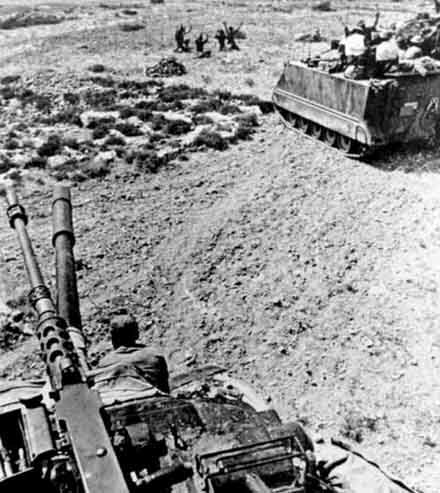 Forces of the Cyprus National Guard at Mia Milia defense lines were outflanked by a massive move of Turkish tanks from Nicosia (west) towards Famagusta (east) during the second phase of the Turkish invasion. Since then, the fortune of these Greek-Cypriot soldiers, and many others, is still unknown. 1. Korellis Antonakis, of Michael, 30 yrs old, from occupied Kythrea, Cyprus. 2. Nicolaou Panicos, of Chrysostomos, 26 yrs old, from occupied Achna, Cyprus. 3. Skordis Christophoros of George, 25 yrs old, from Idhalion, Cyprus. 4. Papayiannis Ioannis of Charalambos, 24 yrs old, from Aglantzia, Cyprus. 5. Hadjikyriacos Ioannis, of Charalambos, 19 yrs old, from occupied Famagusta, Cyprus. Turkey is still denying to provide ANY evidence for their fortune. 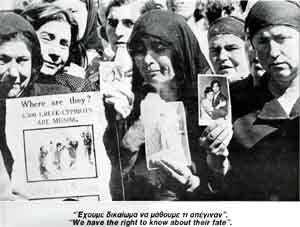 Mothers and other relatives of the missing persons of Cyprus are the most tragic victims of all. Since 1974, they live with the painful question of what have happened to their sons. The mothers of the missing persons are still continuing the struggle by being constantly present at the cease-fire line at Ledra Palace Hotel in divided capital Nicosia. There, they inform tourists and other visitors about the Turkish crimes and Turkish funded terrorism against Cyprus. In this way they deter most of them from visiting the illegally occupied areas of Cyprus, thus supporting economically and politically the occupation regime. For more detailed information regarding the humanitarian issue of the missing persons of Cyprus please CLICK HERE. A total of 1619 Greeks and Greek-Cypriots were reported as missing due to the Turkish military attack of Turkey against Cyprus July 20, 1974. The number of missing persons has been reduced to 1588 after the discovery of some remains and identified them using DNA identification methods. Between the identified are 5 American citizens. 613 missing persons are civilians without any military capacity/identity, including 116 women, 484 were serving their compulsory military service at the time of the invasion, and finally 514 were reservists that were called on arms after the breakage of the Turkish invasion July 20 1974 to face the attacks. For more detailed information regarding the humanitarian issue of the missing persons in Cyprus please CLICK HERE. 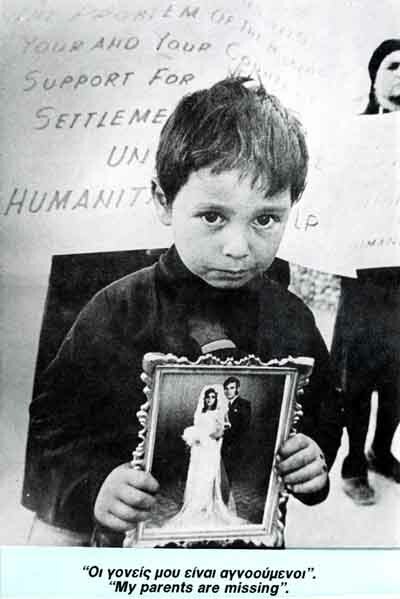 The photo at right was taken immediately after the Turkish invasion and depicts the drama of a Greek-Cypriot boy with tears in his eyes, while trying to locate both his parents. Turkey is stubbornly refusing to disclose ANY information that would lead to the discovery of the fortune of any of the missing persons of Cyprus. In this way it prolongs the injustice inflicted upon the Greek Cypriots, and particularly the pain of the relatives of the missing persons. The only identification of 5 bodies of missing persons was done by an Americans delegation to identify the remains of 5 Greek Cypriot descent, American citizens. The American team was sent to the occupied areas of Cyprus after direct pressures to the White House by the Hasapis family. For more detailed information regarding the humanitarian issue of the missing persons of Cyprus please CLICK HERE. In the photo, a young Greek Cypriot girl, with tears in her eyes, is trying to find her family. 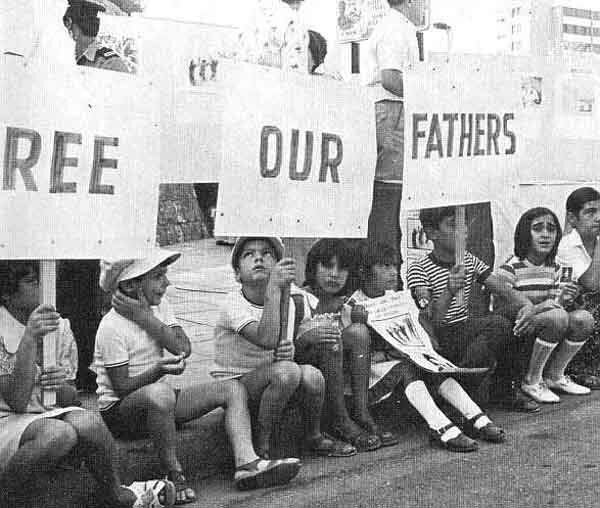 Since 1974, numerous demonstrations took place, both in Cyprus, and abroad, demanding the release of any information that would lead to the discovery of the fortune of the missing persons of the 1974 Cyprus tragedy. The struggle of the Greek Cypriots will continue until the fortune of the last missing person is revealed. In the photo, young Greek Cypriots ask to find out the fortune of their fathers. They hold signs "FREE OUR FATHERS". For more information Click HERE.